Dezjorn International LLC is committed to help our clients reach their goals of branding, public relations and social media influence. Dezjorn Gauthier, J.M. (27) resides in Muskego, WI, USA. Graduated from Marquette University in 2013 with a degree in Criminology, Law Studies and Sociology. He also holds a paralegal diploma, apart of the American Bar Association and completed Washington University School of Law (2017). Dezjorn started modeling at just 6 months old for top children’s brands around the nation and winning national titles. He began his physical transition April 2014; shortly after he was featured in the well known Barneys New York campaign, featuring 17 transgender models. This was the first publishment he had as a transman. With international coverage Dezjorn has been featured in many articles and celebrity shoots. In 2016, Dezjorn was featured in the award winning series America In Transition by Andre Perez. Dezjorn was managed by the world’s first transgender-specific agency in New York. In 2018, Dezjorn was crowned Mr. Wisconsin; being the first title holder of color and of trans-masculine experience for Enchantment US Pageantry System. 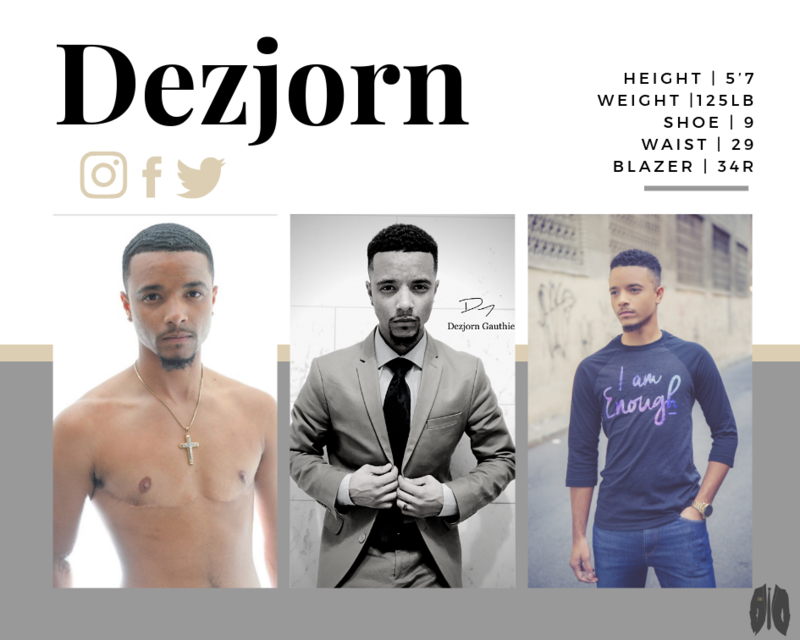 Aside from modeling and furthering his education, Dezjorn started his philanthropic business providing programs and services to effectively bring awareness to the transgender community with a special focus on transmen of color through education, empowerment and inspiration. In 2018 Dezjorn and his wife officially opened The Dezjorn International Foundation Inc; which provides an annual transgender surgery fund, academic scholarships, athletics, and mentoring. Dezjorn also is the Director of Youth Engagement for the Gendercool Project and was Vice President of Point of Pride. With modeling as Dezjorn’s first passion, Dezjorn International LLC recently launched GVII Talent Management and Black T Magazine; the first African American trans-culture magazine. Back in Milwaukee, Dezjorn teaches a high school level law course allowing students to learn more about the justice system, United States constitution and understand policies.